Staying fit and keeping active is vital at any age, but we all tend to put this to the bottom of the list as we get older. Family responsibilities take priority, then aches and pains may set in, and so we move less when in fact we should move more. From the age of 35, your muscle mass declines and your metabolism starts to decrease. So if you still eat the same amount of calories, you could easily gain three pounds a year, which is 30 pounds over ten years! This puts more strain on your joints and your heart, so keeping a healthy weight is vital. Ideally you need to combine exercises to improve your cardiovascular health, strength, mobility, and balance. Age should not be a barrier to trying new activities, and it’s never too late to start. Check out our tips to get you going. Really focus on improving your heart health by doing aerobic exercise, which gets your heart rate up. This could include jogging or speed-walking, workout classes, cycling, or tennis. Choose something you enjoy and make sure you work at an intensity that makes you feel really warm and breathe harder. It’s worth getting a good pair of sneakers if you are walking or jogging to give you good support. Aim to do at least 150 minutes of moderate- to high-intensity exercise a week. That’s 30 minutes a day. 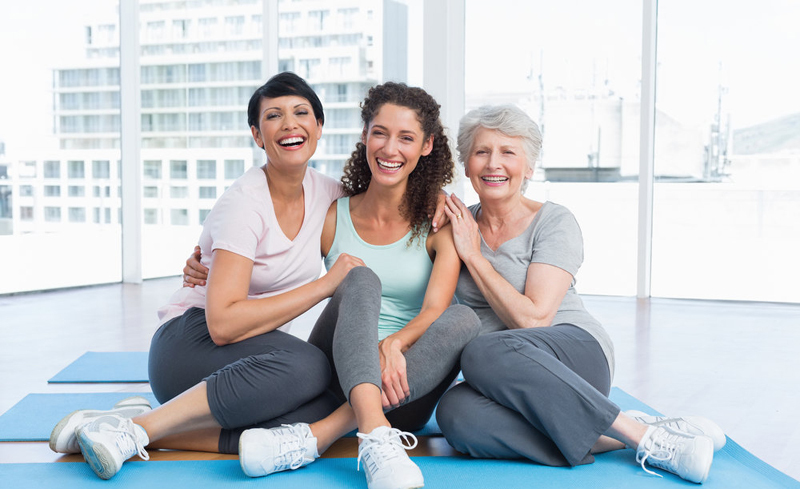 You need to include some weight-bearing exercises at least twice a week to combat the decline in bone density, especially post-menopause. Walking up and down stairs is really effective and can be done whatever the weather — but that only works for your legs. Carrying equally weighted bags of shopping can work for your upper body or standing press-ups against the wall will help strengthen your wrists and forearms. For resistance training to be effective, you need to build up gradually then increase the load so you keep challenging yourself. If you are working with weights, try to build up to do three sets of 10 repetitions before moving onto a heavier weight. Try to do 30 minutes of moderate-intensity exercise at least five times a week. Exercising in water is a great way to add resistance to your workout without straining your joints. If you don’t enjoy swimming, you can simply walk in the water (try forward, backward, and sideways, too). Try exercise classes to improve your balance and stability such as Tai-Chi, yoga, and Pilates. If you find it difficult getting down onto the floor, try to improve your balance at home by standing at the kitchen sink, hold on for support, then raise your heels for five to 10 seconds. When you feel confident, try to do this with just fingertips touching the work surface and eventually without touching at all. Keep active for at least 20 minutes every day. It’s really important not to sit down for long periods of time as this can lead to muscle loss and fatigue. One of the best exercises is simply getting up and down from a sturdy chair several times a day to keep your leg muscles strong, which can help with walking. Do some gentle stretching to keep your joints moving and help your mobility. Stay as active as possible and continue with any exercise you are used to. Just make sure you take a little extra time to warm up and build up intensity gradually. If you find it difficult to exercise for long enough on your feet, then try chair-based exercises as you can get a head-to-toe workout and still improve your muscle strength from a chair. Even doing 10 minutes twice a day will help you maintain mobility and independence.